After several years without any hunting games to speak of – despite having tons during the PS3 / 360 generation – 2017 brought not one but two serious hunting sims to Xbox One and PlayStation 4. 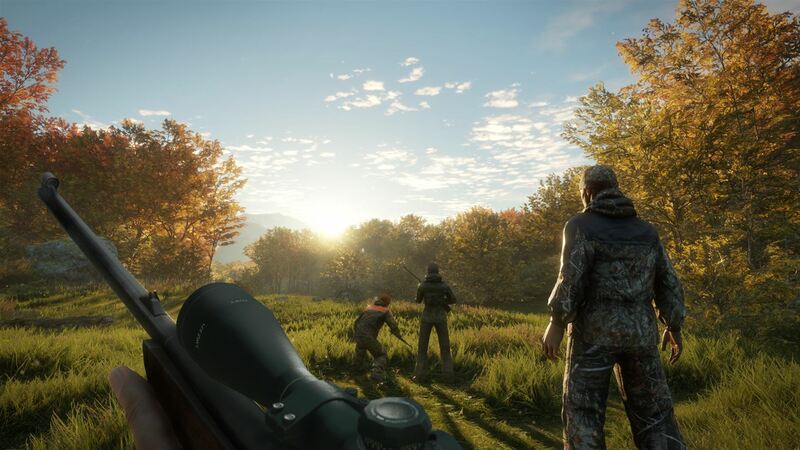 We’ve played Hunting Simulator and theHunter: Call of the Wild extensively and will share our final verdict on which game hunting fans should buy right here. In terms of content, both games feature plenty of stuff to do to justify their $40 price tags. You can spend dozens of hours playing both of them, so $40 seems perfectly reasonable to me. As far as which one has the better content, well, let’s see. Hunting Simulator features 12 different environments spanning arctic tundra, deserts, steep mountains, rolling hills, dense forests, and more. There are 37 species of animals, including birds, along with tons of different firearms and items to choose from. TheHunter: Call of the Wild doesn’t have as much “stuff” – 12 animal species (no birds and no varmints lower the count quite a bit) and less equipment to choose from – and only features two maps – one in Europe and one in the Pacific Northwest in the USA. Most importantly, the big game trophy animals are all represented and while there are only two maps, they are absolutely huge. The two maps add up to 50-square miles of diverse open terrain that feature several different biomes and types of terrain in each. As far as content goes, I honestly consider the two games to be fairly even. Hunting Simulator boasts bigger numbers of maps / species / etc., but it is buoyed by a lot of “fluff” that doesn’t really matter. When you look at key species and key environments, both games will provide hunting fans with exactly what you’re looking for. It also has to be noted that both games also feature the same annoying grind to actually accessing all of the content – you have to unlock all of the weapons and equipment by playing for hours and hours – and it is equally obnoxious in both. TheHunter pulls out a slight edge here since both of its maps are available from the start while you have to unlock the 12 areas in Hunting Simulator one by one. 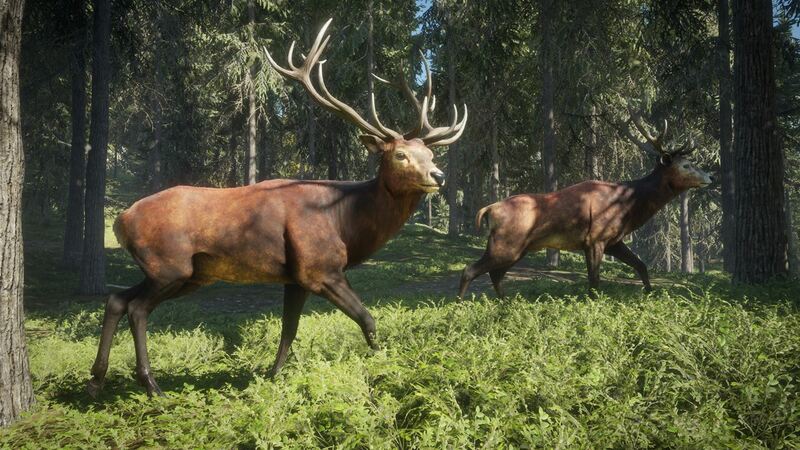 Both theHunter: Call of the Wild and Hunting Simulators are first-person open world games where you can go where you want and hunt any species you want and kind of do whatever. Likewise, both games require you to be mindful of the wind and the noise you make and both have onscreen indicators for tracks and animal sounds to point you in the right direction of where you should be able to find something to shoot at. And both games start off fairly slowly where you have weaker guns and poor equipment and every shot you successfully take is a miracle until you level up your skills and have some better equipment. I do think theHunter: Call of the Wild has some distinct advantages here, though. I think the hunting and tracking aspects are more realistic in theHunter than they are in Hunting Simulator and actually finding animals feels a lot more satisfying because of it. TheHunter also lets you drive a four-wheeler to get around the massive areas faster, which is much appreciated. Animal behavior is more realistic in theHunter as well as they don’t just walk in a straight line (and poop every 15-yards to leave a nice trail for you to follow) and spooked animals don’t run away for 100-yards and then turn around and walk straight back at you like they do in Hunting Simulator. I don’t like the fact that the guns seem way underpowered in theHunter – so even little deer don’t go down in one shot a lot of the time – so you spend a lot of time following blood trails through the woods, which isn’t really realistic (which I can say from experience using the same .243 rifle in real life that is your first gun in the game). Eventually you get better guns, though, and theHunter’s other strengths help it separate from Hunting Simulator even further. Presentation-wise, this comparison really isn’t very close. 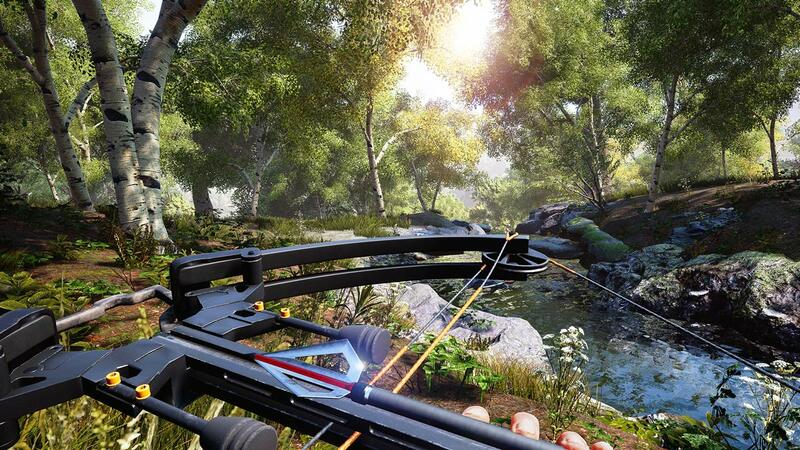 TheHunter: Call of the Wild is stunningly good looking with lush vegetation and great lighting and weather effects. And, unlike Hunting Simulator, it has a draw distance further out than 20-yards in front of you so you don’t see the game world literally building itself before your eyes as you walk. Looking through a scope or binoculars in Hunting Simulator is also just painful as the loss of detail past 50-yards or so is extreme and makes the game look downright ugly. There is also loss of detail at range in theHunter, but it isn’t nearly as severe. 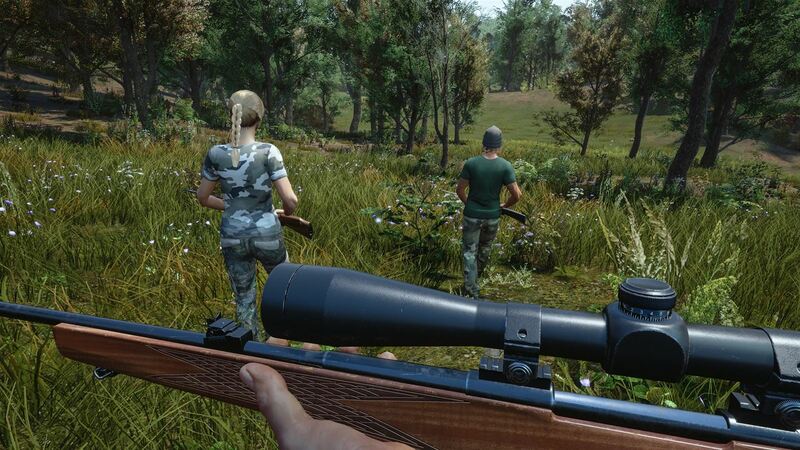 There is little question that theHunter looks a lot better visually than Hunting Simulator. As far as the sound goes, theHunter edges out a victory here as well. 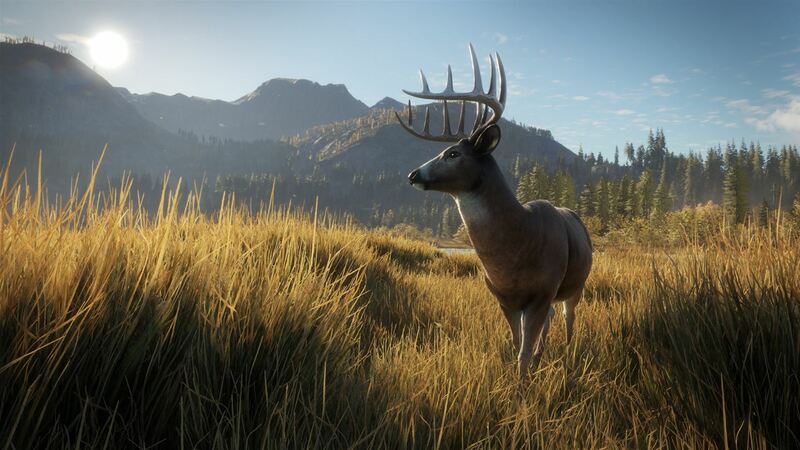 The animal sounds in both games are solid – unrealistically loud and frequent, but solid – but theHunter: Call of the Wild has far better ambient environmental sound effects. Multiple species of birds and the wind rustling through the trees and a ton of other natural sound effects really make you feel like you’re standing out in nature while playing theHunter. Overall I have to declare theHunter: Call of the Wild as the ultimate winner and the game that I would recommend hunting fans to purchase. Both games have somewhat unsatisfying shooting and having to unlock everything is a drag, but theHunter: Call of the Wild’s superior gameplay and presentation make it a much better experience overall. Disclosure: Review codes for both games were provided by their respective publishers.